I am making changes in NDPS (NPDS is a Web server for Newton). But in order not to make you wait a long time (since I’m not fast) I add this feature to the current version of NDPS. 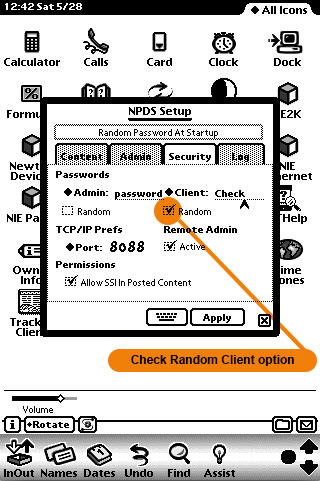 We must activate the Random option in the module [NPDS Setup] Tab: Security, for the “Clients” and that’s it! Now there are in the form (WitheBoard) a password to submit message (“CCP“ for Curent Client Password). Obviously as the password can not be known by visitors, it is displayed on the default home page. You tell me, “it’s not very secure!“. Perhaps, but the goal is not to prohibit visitors to post messages but to block Spam bots. And it works! I also added the SSI <UPTIME> internally in NPDS. UPTIME shows the time since the Newton reboot. For those who already use <UPTIME> remember either of the disable your script in [Script Editor] module or delete it, you’ll need!